Course Website: Official Website - Visit Las Vegas Country Club's official website by clicking on the link provided. Accolades: Ranked 10th in Nevada on Golf Course Gurus' Best in State list. What to Expect: When I think of golf in Las Vegas, I think of playing in the desert with island style tee boxes and fairways. 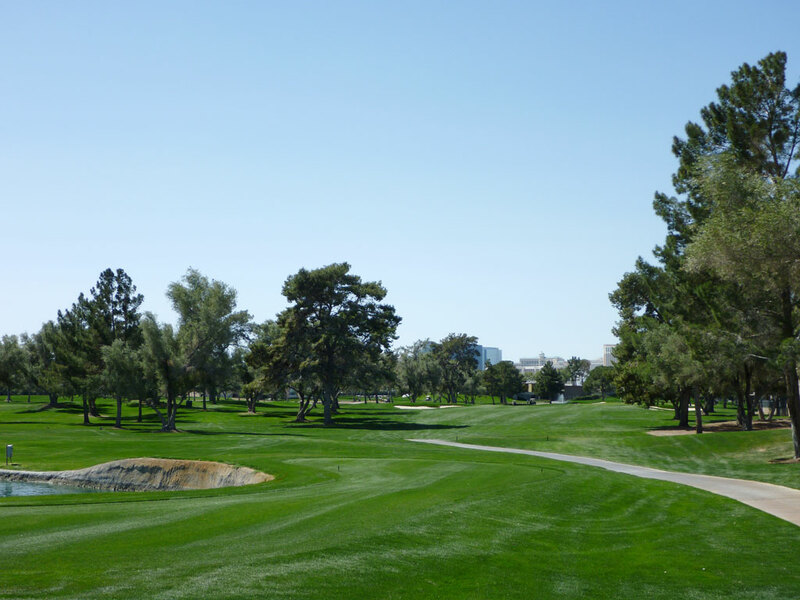 My cleats generally take a pounding whenever I hit a wayward tee shot as I go walking through the rocky surrounds, but at Las Vegas Country Club, it feels like the furthest thing from desert golf. The parkland style golf club features pristine, posh conditions and grass rather than desert outside the fairways. 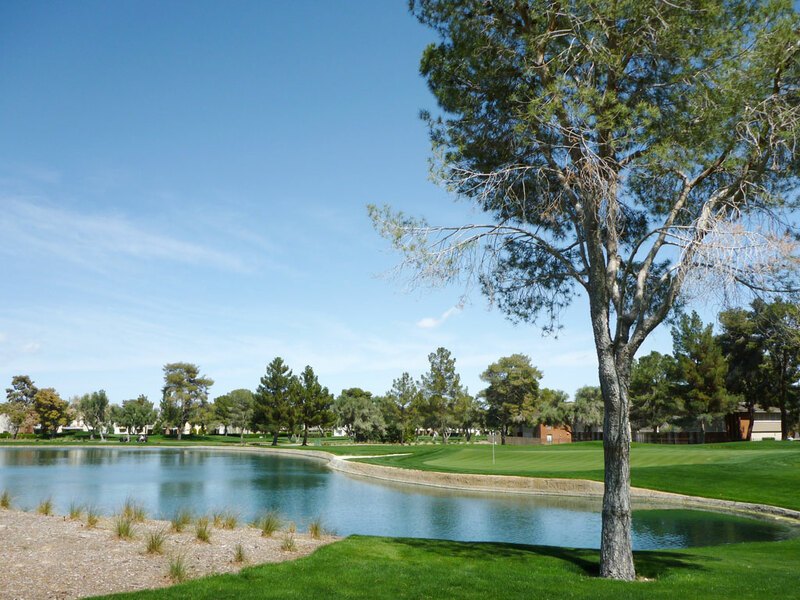 Trees line the fairways (along with some houses) and a handful of water hazards come into play at this club located in between the airport and downtown Vegas. The club features a 44,000 square foot clubhouse and a small practice range that is fully enclosed by nets and features a newer rubber turf material from which to play on. 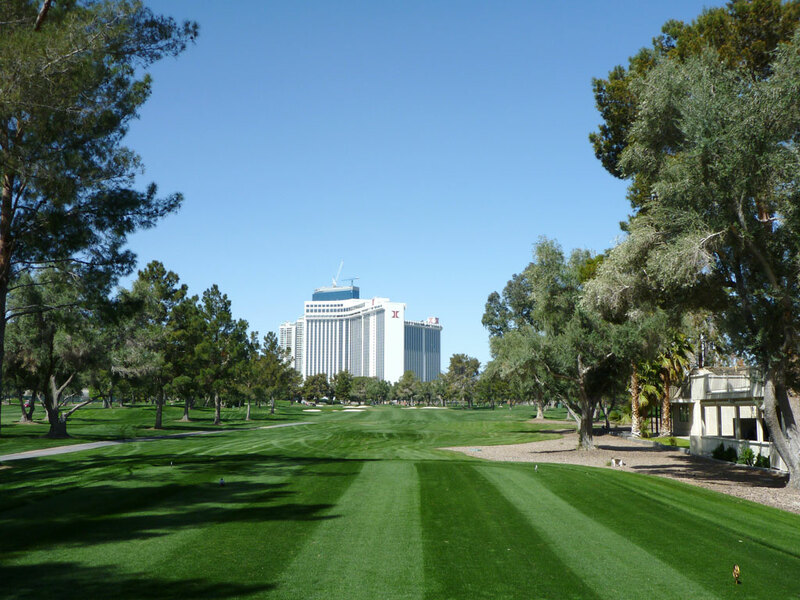 While most of the time the peaceful setting and surroundings make your forget you are in the desert, the towering Hilton Hotel featured as its prominence on the final holes of the back nine remind you that you are still in Vegas and more fun awaits after the round. All in all, Las Vegas Country Club caught me off guard; in a good way. I had heard very little about the course and it rarely surfaces in the upper echelon of rankings for Las Vegas or Nevada, but this underrated classic features some great holes, conditioning, and a memorable experience. 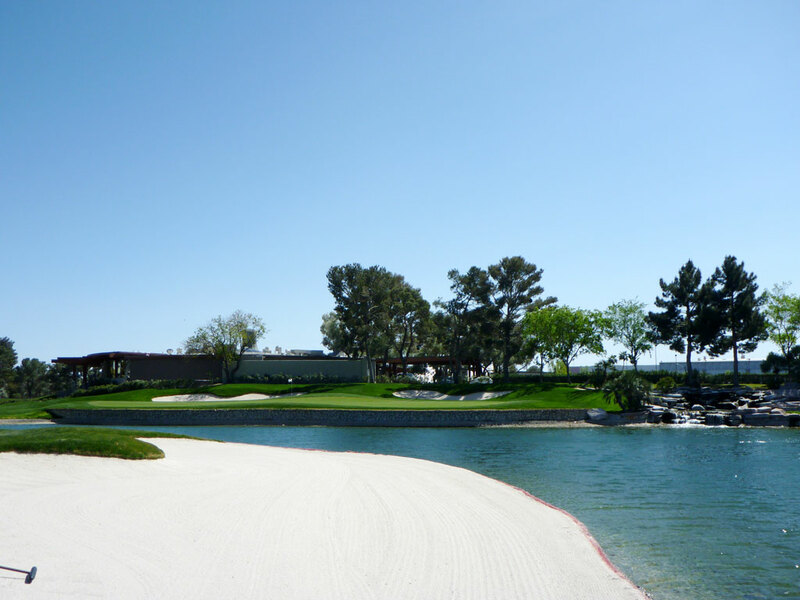 Signature Hole: 18th Hole – 525 Yard Par 5 – I guarantee you won’t forget the finishing hole at Las Vegas Country Club. After navigating your way down the fairway, the hole turns to the right and swoops down to a pond and large bunker fronting the wide, shallow green. With a waterfall cascading to the right of the green and the clubhouse in the background, it is a beautiful and memorable finish. Best Par 3: 17th Hole – 205 Yards – Taking wind into account before hitting a shot is part of most players pre-shot routine; how much the trees will knock down the wind, how strong the wind is coming off the ocean, how much extra carry a helper wind will provide. 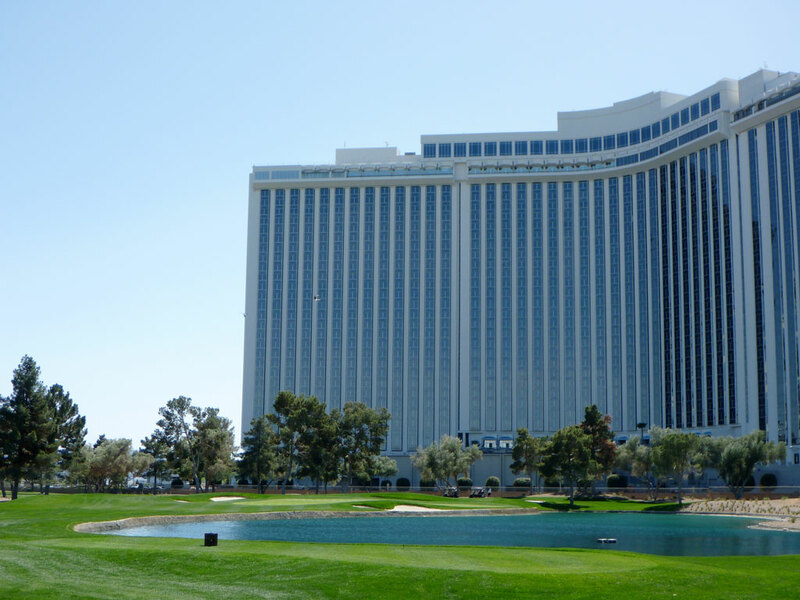 However, teeing up at the 17th hole at Las Vegas Country Club is the first time that I had to judge how to account for the swirling wind that was coming in from the nearby towering Las Vegas Hilton Hotel. The tee shot plays over a sparkling blue pond to a green that is surrounded by a trio of bunkers. A right side pin is the most dangerous to attack since the water butts up next to the green at that point. The swirling winds, bunkers, and pond all combine for an excellent challenge on the final par three of the round. Best Par 4: 11th Hole – 443 Yards – This straightaway hole features a pond on the left of the tee box and houses up the right. A good drive needs to clear the trio of fairway bunkers and stay between the trees while a slice off the tee will find the bottom of a pond. Another trio of bunkers is found surrounding the green with the setup begging for a left to right approach into the green. The demanding tee shot combined with the intriguing green complex form a solid par four. 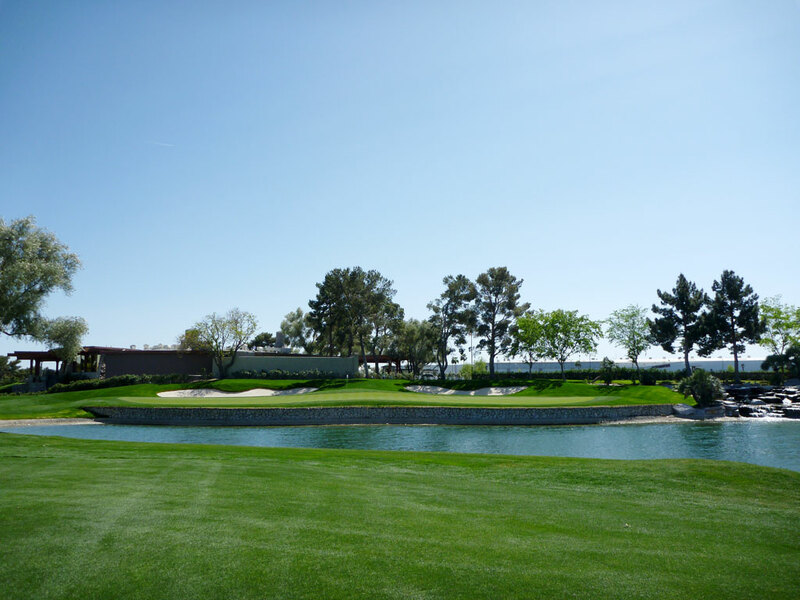 Best Par 5: 18th Hole – 525 Yards – LVCC’s final hole is a presents a high risk, high reward finish. The fairway is protected by two bunkers on the right and a single bunker on the left before moving to the right along Joe W. Brown Drive. A large bunker of each side of the fairway 50 yards short of the green are a factor to be aware of, but the real risk is in challenging the pond the fronts the putting surface. The green is quite shallow but features a pair of bunkers to the rear that can act as a backstop if your approach is coming in hot. With a fairway wood in your hand, you would likely only go for the green in two if you REALLY needed a birdie or eagle, otherwise most players will layup. However, if you bust a big enough drive to leave an iron in your hand for the approach it just might be worth the risk. What else would you expect than a gambling hole to finish at in Vegas? Birdie Time: 9th Hole – 484 Yard Par 5 – Par fives under 500 yards from the tips are just begging to yield a birdie, and that is what you get as the closing hole on the front nine. That being said, this hole isn’t a pushover due to the amount of trouble you can potentially find yourself in. A large bunker cuts in from the left side of the fairway near the landing zone of most players tee shots and consumes nearly ¾ of the fairway in that location. Playing to the right of that large bunker brings into play two smaller bunkers that you will want to avoid. The big decision on this hole is deciding whether to go for the green in two; a green that is protected by water in the front and bunkers on the right and in the back. If you feel comfortable taking a rip at this relatively deep green then go for it; otherwise there is plenty of room to layup short of the water and wedge it close. Either way, getting a birdie should be on your mind. Bogey Beware: 5th Hole – 471 Yard Par 4 – Long, straight, and lined with houses/o.b. on both sides. Five bunkers are found on the hole with the only water hazards being the pools sitting in the backyards of the neighboring properties. Watch a video of Bill Satterfield and Mark Parry taking on Las Vegas CC's 5th hole in a brutal wind, but coming out victorius.